A simple wish from the pupils: “tsinelas” for the new year. 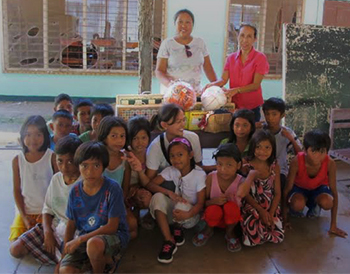 Wish granted, with help from the teachers, volunteers, & local vendors. …and happy tummy! FOOD for everybody! Best of all, smiley faces! 5-18: OC Mix Family Fair. Children’s book donations and discounts, Philippines’ 1st copies–with autographs! A month or so later, the box arrives at The Book Bridge. Alva Sachs, Circus Fever; On Your Mark, Get Set, Go! To top it off, ice cream for everyone! *One promising student received donation in the form of groceries for the whole family. Thanks to the local print shop and creamery! …is enough to make these children smile!